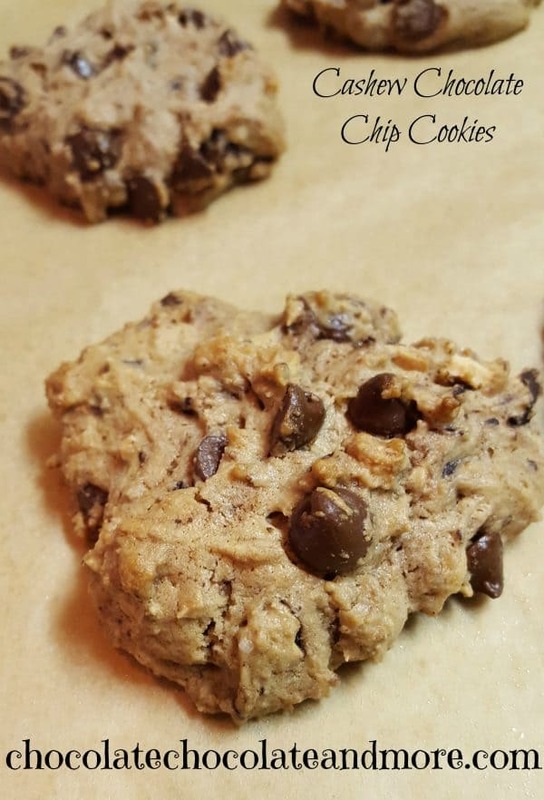 Cashew Chocolate Chip Cookies - Chocolate Chocolate and More! I have always been a sucker for nuts — I love them by the handful or in salads or desserts. 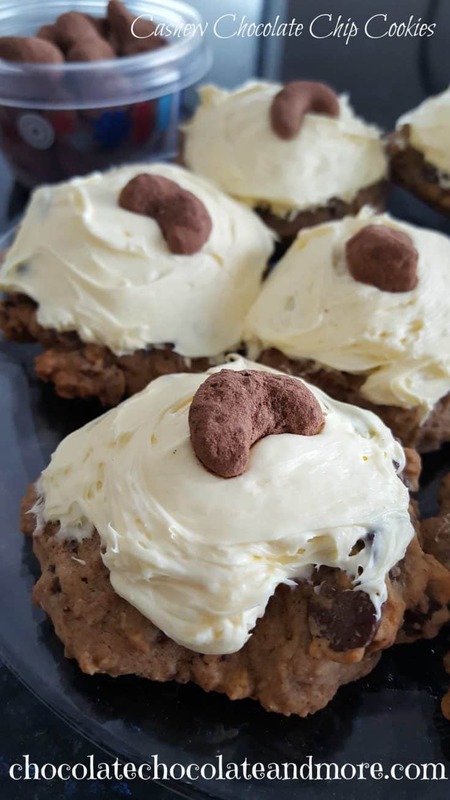 I recently received some chocolate covered cashews from East Bali Cashews and while eating them directly out of the bag was an excellent option, using them in a cookie sounded like an even better idea — and that is how these cashew chocolate chip cookies were born! The cashews are covered in powdered cocoa, not a chocolate shell. While that provided some chocolate flavor I decided to toss in some chocolate chips to make it even more chocolaty! You can chop the cashews as roughly or as fine as you want — I used a meat tenderizer and hammered on the nuts in a ziploc bag so I got a variety of sizes. My only suggestion is you don’t put them in whole as it doesn’t really spread the nutty flavor around as much as the smaller pieces will. You can also change the kind of chocolate chips you use — white chocolate would compliment this recipe nicely. The icing is also not a requirement to make the cookies taste great, but it certainly doesn’t hurt! You can either just spread the icing on with a knife (like I did), or if you want to be fancy about it, place the finished icing into a sandwich bag, snip off a small corner, and decorate to your heart’s content! 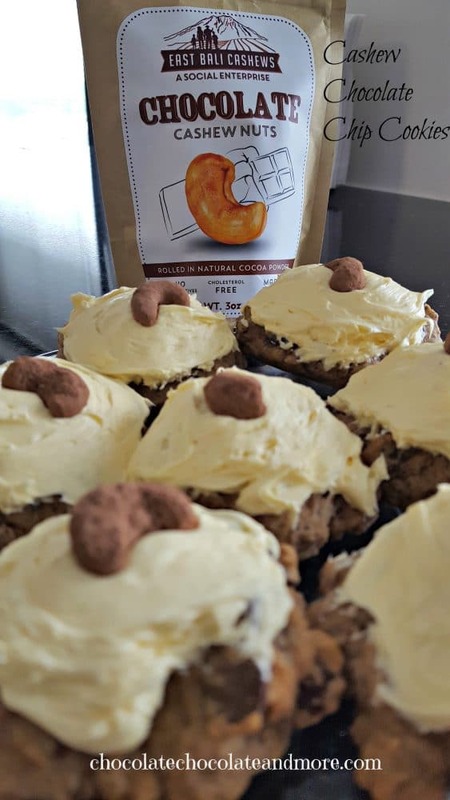 You can buy the East Bali Chocolate Cashews, or any of their other products (Native, Sea Salt, Chili Crunch, and Garlic Pepper), via East Bali Cashews on Amazon. Right now that is the only place they are available for purchase in the United States. I bet all but the Garlic Pepper would actually be pretty good in this cookie recipe if you wanted to give them all a try! In a large bowl, cream together the 1/2 cup butter and sugar until light and fluffy. Add the egg, beating well, then stir in the sour cream and 1 teaspoon vanilla. Gradually stir into the creamed mixture. Bake for 15 minutes. Remove from oven and cool completely. Gradually beat in the confectioners' sugar and 1 teaspoon vanilla until smooth.